PlayerUnknown’s Battlegrounds has been a smash hit since it first released on PC, and continues to see millions of players each day across PC, Xbox One, and now mobile. A recent update to version 0.4.0 for iOS adds support for PUBG 3D Touch controls. Here’s how to enable them in-game. 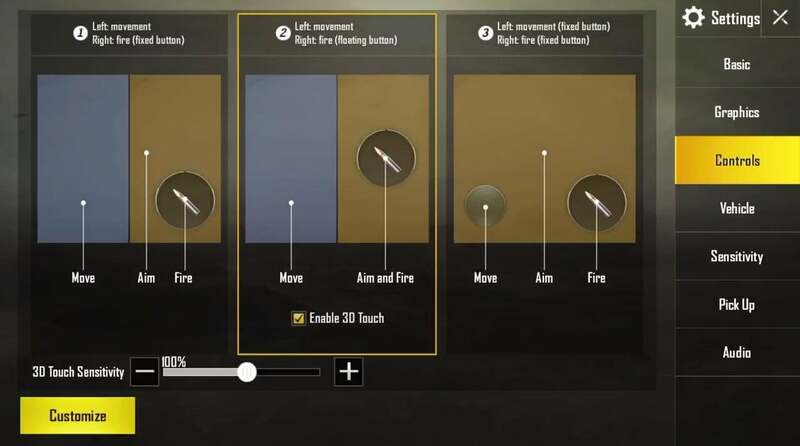 The update to add PUBG 3D touch controls with version 0.4.0 for iOS doesn’t explain much about the feature or what it actually entails to enable it – simply saying “Added 3D Touch firing options to iOS.” However, those who have had a chance to give the feature a try are giving PUBG 3D touch rave reviews. When the feature is enabled, players can fire their weapon just by pushing a little bit harder on the iPhone screen – just as they would if they were using the feature to open menus or taking advantage of the peek and pop feature that Photos and other apps have to offer. This is a unique feature that adds some functionality to an app that many feel is a little more difficult to control than the standard game on PC or Xbox One. While the downloads of PUBG mobile have been nothing short of crazy, the addition of PUBG 3D touch controls certainly makes the game a little easier to access for those new to shooters on mobile – potentially increasing downloads and player retention as the game because easier to access and control for iOS users. While this feature is useless for those playing on iOS devices that don’t support 3D touch or for Android users, it certainly has the potential to revolutionize how people play the game. The feature is disabled by default, but if you want to turn on PUBG 3D touch controls, simply follow the steps below. Open the app and navigate to Settings > Controls. At this point, you’ll be presented with multiple layouts. Change the option to Layout 2. This is all you need to get the feature turned on and added to your game, but you may wish to adjust the sensitivity. We recommend starting with 200% and fine tuning it from there so you don’t have to press down super hard on your screen. The actual setting that is best for you is a personal decision, but after a few games and some trial and error you should arrive at a setup for PUBG 3D touch controls that gets the job done and makes coming out on top in the mobile Battle Royale arena that much easier. If you find that the PUBG 3D touch controls aren’t enabled after following this process, there’s a possibility you have 3D touch disabled on the iPhone itself. To check on this feature, navigate to Settings > General > Accessibility > 3D Touch and ensure that the feature is turned on.